Astronomers from around the world come to Parkes Observatory to use the telescope to observe naturally produced radio energy from space. 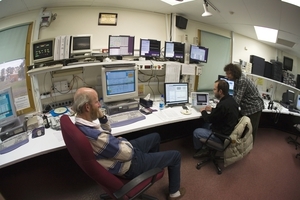 They control the telescope from a desktop computer and monitor the operation of the telescope and some initial results on the monitors around the room. The data is recorded for later analysis.